It's easy to look at the Gwinnett Stripers' 2018 season as a tale of two halves: A first half that saw a sluggish offense and unstable bullpen fall a season-worst 15-games below .500 just before the All-Star break, and a resilient second-half effort that catapulted the team into a playoff race and a 70-69 record. 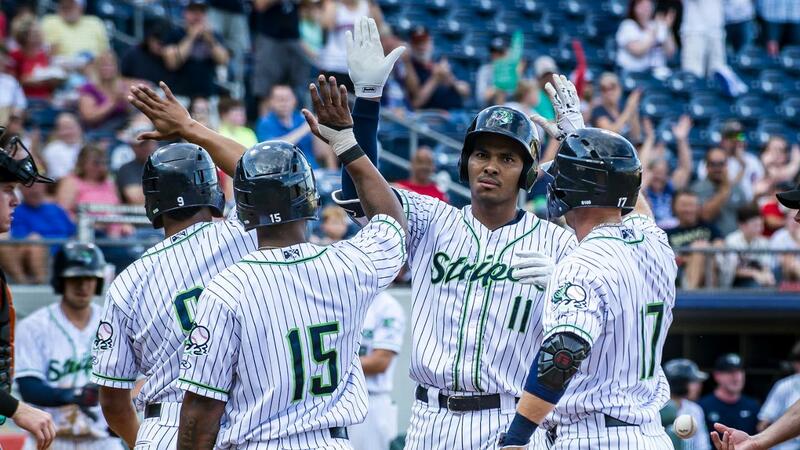 Yet cast records aside, and the Stripers' season was filled with prominent storylines from game No. 1 to game No. 139. From the ascent of Ronald Acuna Jr. to the late additions of three top Atlanta Braves pitching prospects, every month had a story to tell. The undeniable headline entering 2018 was the trajectory of Acuña, who entered the campaign rated the No. 2 prospect in baseball by MLBPipeline behind Shohei Ohtani of the Los Angeles Angels. Coming off a stellar 2017 season in which he batted .344 with 21 home runs, 82 RBIs and 44 stolen bases in 139 games across three levels, the hype surrounding Acuña and his anticipated first big-league call-up followed the 20-year-old for weeks to start the season. Acuña got off to a dismal start, however, leading many to believe his promotion could be pushed back. Through 10 games, he was batting just .175 (7-for-40), hitting his first and only home run on April 17 versus Scranton/Wilkes-Barre. In the meantime, fellow 20-year-old prospects Mike Soroka and Kolby Allard made the Stripers' Opening Day roster for their respective Triple-A debuts. Soroka came out of the gate with guns blazing, going 2-0 with a 1.99 ERA over his first four starts, including a 7.0-inning complete-game shutout on April 23 at Rochester. Allard also got off to a good start, going 1-1 with a 2.57 ERA in April. After hitting safely in seven of eight games from April 17-24, Acuña got his much-awaited call-up to the Atlanta Braves on April 25. Soroka followed suit with his first Major League call-up on May 1. Overall, the Stripers hit just .239 as a team in April, slumping to an 8-14 record with the likes of MLB veterans such as Jose Bautista, Rob Brantly, Jaff Decker, Christian Colon and Ezequiel Carrera in the everyday lineup. "The first half of the season, offensively we got off to such a poor start up and down the lineup," manager Damon Berryhill said. "For the first month of the season, it was just a struggle to get any runs on the board." Roster moves were made in May that cleared the way for slugging prospect Austin Riley on May 7 and hot-hitting Michael Reed on May 29. The team finished May with a 16-13 record with those two in the middle of the lineup, plus a month in which Allard went 3-0 with a 1.80 ERA in five starts and first baseman Carlos Franco hit five homers with 21 RBIs. The team regressed again in June, starting the month off with a seven-game losing streak as Riley hit the disabled list with a knee injury on June 6. An eight-game losing streak at the end of June put the month's record at 11-19 and 12 games under .500 overall at 34-46. July began on another downward note, starting with a four-game losing skid to fall 15 below .500 (35-50) on July 4. But something clicked on July 5, the night of right-handed prospect Touki Toussaint's Triple-A debut in a win against the Norfolk Tides. Beginning with that victory, the Stripers rolled to a 35-19 (.648) record in their final 54 games, riding a balanced lineup and more consistent pitching. Hard-throwing relievers Jacob Webb, Chad Sobotka and Adam McCreery were promoted from Double-A Mississippi and became staples in Gwinnett's bullpen, as were Toussaint, Kyle Wright and Bryse Wilson in the rotation upon their arrivals. "The influx of young arms that we got definitely helped us out," Berryhill said. "Good power arms coming out of the bullpen, plus Wright and Wilson starting. I think our starters - for the most part - all year did a nice job. Once we settled in with our bullpen and kind of stayed status quo for about three weeks, that really got us going and got us an opportunity to really get on a roll." In that time, shortstop Luis Marte was also promoted to Gwinnett from Mississippi. An unsuspecting call-up at the time, Marte made an immediate impact by hitting .389 over his first 17 games with the club, earning Gwinnett's July Player of the Month award from Atlanta. "Second half, I think Marte was a big addition, along with Reed and Riley coming back healthy," Berryhill said. "Marte gives (Sean) Kazmar a chance to rest, (Phil) Gosselin a chance to rest. Once they got that opportunity, their bats started to come around and perform a lot better." Offensively, the Stripers relied mainly on Riley, Franco (Gwinnett's lone Triple-A All-Star Game representative), Dustin Peterson and Rio Ruiz, who accounted for 48 of the team's 101 home runs (48 percent) and 250 of the team's 551 runs driven in (45 percent). Add in Reed, who batted .363 over 53 games, and the Stripers had a solid nucleus after his arrival in late-May onward. Gwinnett was an International League-best 18-11 (.621) in August, remaining in the playoff picture until the season's final weekend when the Stripers were officially eliminated from Wild Card contention on August 31. Ruiz was named the team's Most Valuable Player after leading the team in games played (130) and batting average (.269) among qualified hitters. He also showed defensive versatility, starting 49 games at third base, 35 games at first and 31 games in the outfield, which was a new experiment for him this year. "I think it allows teams to see what I can actually do, and puts me in a position to be in the big leagues here in Atlanta," Ruiz said of his ability to play the infield and outfield. "It shows how versatile I actually am. As long as I'm in the lineup every day, that's all I really care about." "Rio bouncing around position-to-position I think has helped him a bunch, showing his versatility," Berryhill echoed. "Offensively, he's really kind of held us down. I put him in the two-hole, four-hole, three-hole - he hit in all spots in this lineup and performed really well for us." Allard finished the season 6-4 with a 2.72 ERA in a team-high 19 starts, winning the team's Most Outstanding Pitcher award. Toussaint was an impressive 5-0 with a 1.43 ERA in his eight starts with Gwinnett. Wright was 2-1 with a 2.51 ERA in his brief time with the club over seven games (four starts). On August 15 versus Louisville, Wilson struck out 13 Bats to set a nearly decade-old Gwinnett record. In total, Berryhill used a club-record 26 starting pitchers in 2018, due in large part to the Braves' front office strategy of rotating fresh arms between Gwinnett and Atlanta. "I think it speaks to where we're at as an organization," Berryhill said. "That's the way the game is trending. They're trying to win a division up there, and they're going to use every piece of that 40-man that they can, and they've shown that they're going to make moves to get other people on the 40-man. Number one goal is to win up there, and they're doing a phenomenal job. It shows how strong our system is that we can plug in 26 different starters." In total, 10 Stripers pitchers made their Major League debuts in 2018: Allard, Toussaint, Soroka, Wright, Wilson, McCreery, Sobotka, Wes Parsons, Jesse Biddle and Evan Phillips. Acuña and Peterson also made their big-league debuts. Looking toward the 2019 season, the Stripers can expect a similar flow of pitchers on the cusp of making the Major League roster. Berryhill said that given this season's results, there's no reason Braves and Stripers fans can't expect an even better outcome in 2019. "We've proven with the pitching staff, we've run them up and they've performed well in the big leagues and they've helped the Braves," Berryhill said. "It's a great problem to have, but the Braves are looking at probably six or seven guys that have a chance to make that club next year and contribute. They're all young guys, so they're going to be Braves for a while."